Our Visit Wales 2* graded bunkhouse & bungalow are great options for friends or groups looking for good value accommodation in a quiet and peaceful location with fabulous views of the Black Mountains and the Wye Valley. It is perfect for just chilling out and yet is only half a mile away from the village of Felindre with its friendly local pub, which serves good pub food. Hay on Wye with its wider range of facilities is just 5 miles away. The main Bunkhouse accommodation has 7 rooms on the first floors, sleeping between 4 and 8, a total of 48 beds, split between 2 buildings. 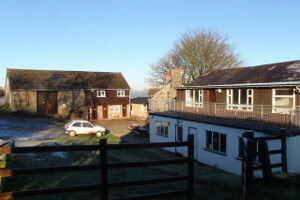 (The Old Stables has 4 rooms sleeping 32 and the Tack Barn has 3 rooms sleeping 16). 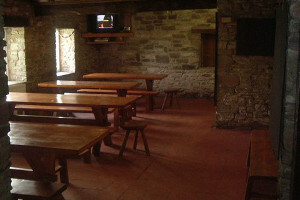 The dining room has picnic style tables with bench seating and has a wealth of stone walls and exposed beams. There is a lounge room with comfortable settees and chairs and a pool table. 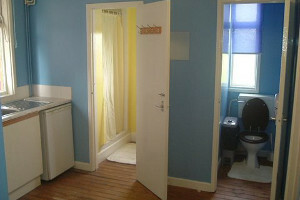 There are 3 shower/toilet rooms on the ground floors. All rooms are centrally heated, and the kitchen is well equipped, with a six-burner cooker, grill, microwave, fridge, freezer, double sinks, a commercial dishwasher, plenty of crockery, utensils and pots & pans. The bungalow can sleep up to 9 people, in 3 rooms on the ground floor each sleeping 3. This has its own bathroom/shower room, a small kitchen area and a lounge area and is suitable for smaller groups or can be booked as part of the main bunkhouse for more accommodation. We are well situated for a variety of outdoor activities; some of the best horse riding country in Britain is on our doorstep. Well, we are a Riding Centre after all! We can cater for riders and novices, and have a choice of rides from an hour to a full day ride with a stop at a pub for lunch. 2.5 miles off A438 at Glasbury-on-Wye. 5 miles from Hay-on-Wye. 12 miles from Brecon.